Hope you all had a great Halloween weekend and enjoyed getting an extra hour of sleep. I have a one year old so I assume that I would be getting up at the same time however keeping her up a little bit later two nights in a row bought us time yesterday morning! J.Crew is having an extra 30% off their sale items. Don’t forget to enter the Kendra Scott giveaway, that ends today! Love the jewel details on your sweater, so pretty! 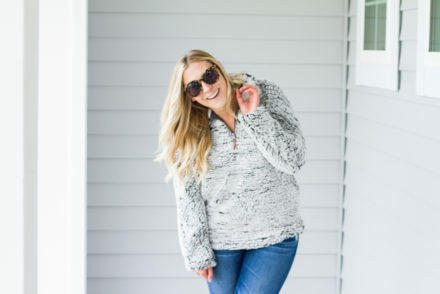 Love that sweater! Gray is one of my favorite fall colors too! I love the pop from your Gigi clutch! 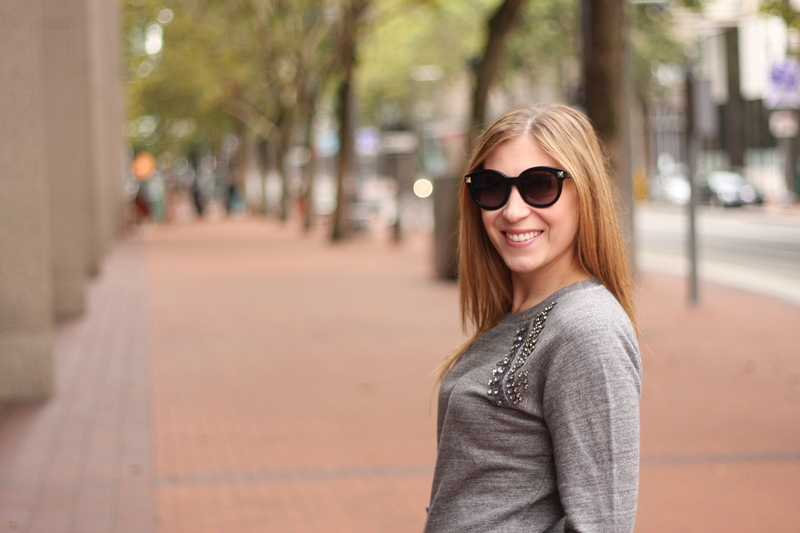 Gray is always a good choice for fall! I love all of this grey with that pop of pink! That clutch is such a fun color! Loving your embellished sweater! You can wear it so many ways! And I love that fun, bright clutch…the perfect accessory! 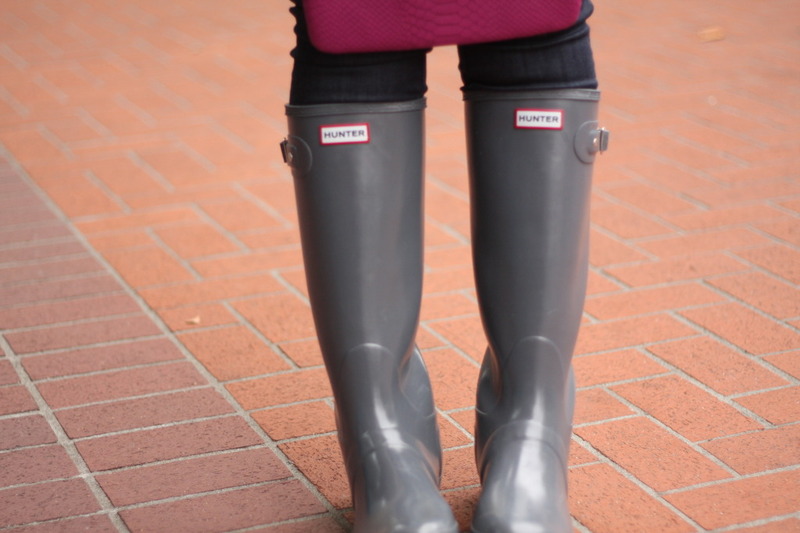 Ah your hunter rain boots are absolutely darling! I love the gray on gray look! That embellished sweatshirt is beautiful! Those are such great boots and I love your sweater too! 🙂 Thanks for sharing about the JCrew sale!! You are so cute! I love the embellished sweater, this is totally my kind of outfit. 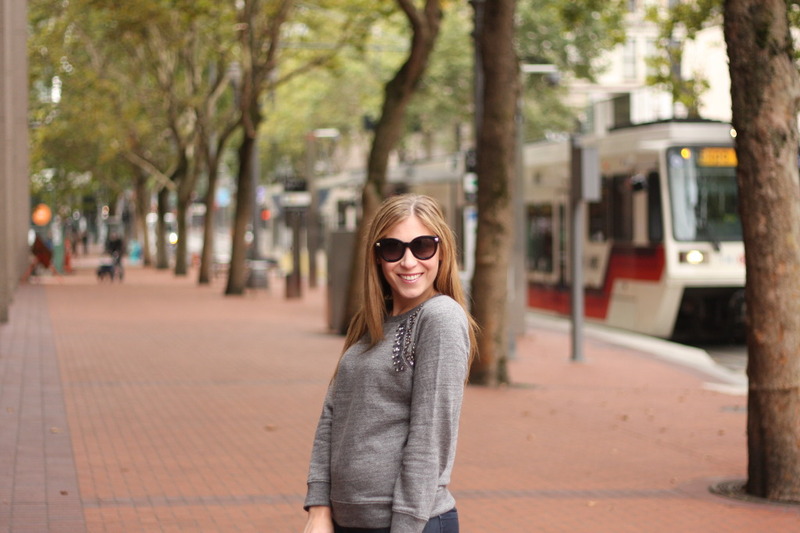 Love your sweater and a pop of pink! 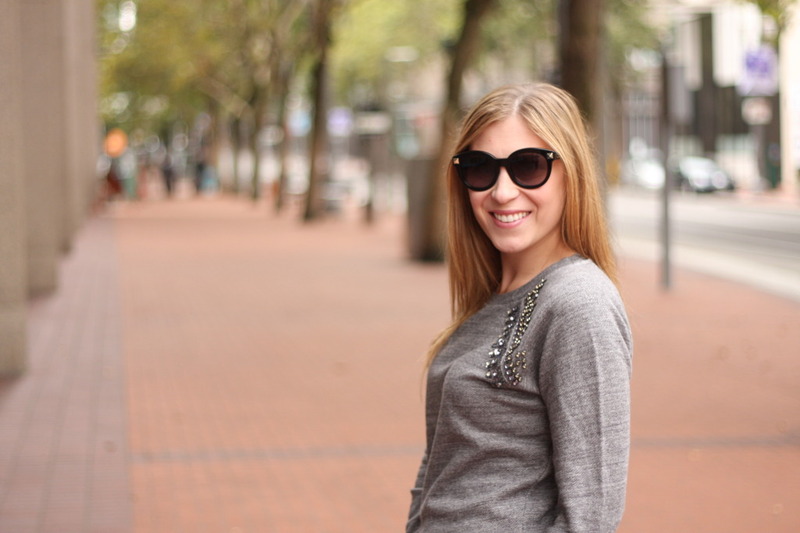 Sweat shirts are always better with a little embellishment! Such an effortlessly chic look! Loving the shades of grey!! Those boots are too cute and love your clutch! 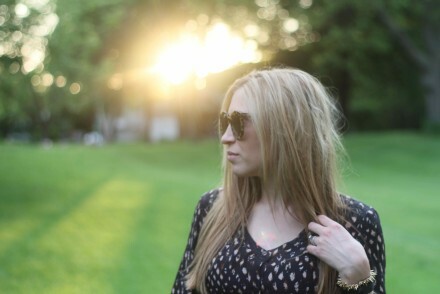 love the detailing ony our sunglasses! Love the touch of pink. Your sweater and clutch are so cute! Love the embellishment! I love this look! I adore Hunter wellies! I love the detailing on your sweater! It is so pretty! Great pictures, lovely embellished sweater! Gray and radiant orchid is a great combination! Love your gray hunters too! I just LOVVVVVE your sweatshirt with the gems on it! SOOOO Stunning!! SOOO chic! Fab boots! So cute! Love the grey! you rock the hunter boots! looking super cute! I have that GiGi clutch in the same color! It’s one of my faves! I love the pretty sparkly sweater with the hunter boots! I have been wanting a pair of rain boots but I would be lucky if I get to use them 1 time a year. Hi Lindsay. I absolutely adore this outfit: gray its one of my favorite colors!!! !